A dentist in Columbus, Ohio, has noticed that dental insurance companies have begun to carefully review insurance claims for a second time, months after the initial benefit check has been sent. Sometimes, overpayments are discovered, so the insurance company sends a letter to dentists informing them of the overpayment -- usually a nominal amount -- and requests repayment within 30 days. The amounts are normally too small to dispute, and specific details are not given, only the amount requested," the Columbus dentist writes. But when he or other dentists refund the money, they face a tough choice -- "either eat the loss or re-bill their patients, who think they already paid in full." It strikes the Columbus dentist as unlikely that the insurance companies would never encounter any claims where the dentist was underpaid, but he's yet to hear of a dentist receiving an underpayment check. "If the company is sloppy enough to make so many overpayments, it probably makes occasional underpayments," he writes. He believes the right thing would be for insurance companies to look for underpayments as well as overpayments, and reimburse the dentists (or patients) the difference. Recently, he received a letter requesting $23.55 for a claim that was processed and settled last fall. He sent a check, including the group number and claim number, but, he writes that he "also gave them a taste of their own medicine. I made the amount for $25.53. If or when the check clears, I will inform the insurance company that records show they were overpaid by $1.98, and give them 30 days to repay me." He indicates that he's a little bit uncomfortable having pulled this tactic since it will result in further paperwork and wasted time for the insurance company. "Is it wrong to alter my ethics to the level practiced by this particular insurance company?" he asks. "Is there a better way to respond? I know many dentists in the same boat." In the phrasing of the Columbus dentist's question, he may have his answer. By "altering" his ethics, he's implying that he finds the insurance company's after-the-fact selective re-billing to make up for a previous error ethically questionable. If he then sees himself doing something that he holds to be equally ethically questionable just to make life troublesome for the insurance company, then he's likely going against his own values to do so. While he might take some joy in seeing a company that frustrates him suffer just a little bit in return, more paperwork and more time on the part of the insurance company might only result in those costs being passed onto him and his fellow dentists and patients. The best thing would be for the insurance companies to try to get the billing correct the first time around so later rebilling would be unnecessary. But short of that, the Columbus dentist is correct: The right thing is for the insurance company to notify doctors and patients of underpayments as well as overpayments and to refund any money that a patient may have overpaid. It still will be a nuisance to have to deal with the inefficiencies, but at the very least dentists and patients will know they are being treated fairly. When you hear people talking about you when you know you were not meant to hear them, is it OK to keep listening? That's what a reader from Utah wants to know. The reader is an employee of a publicly funded institution whose board is required to hold open and public meetings. She was attending one such meeting when the board decided to go into closed session. The reader left the room where the board was meeting and moved about 10 feet down the hall with others to wait until the end of the closed session. The door to the boardroom was closed. "I was chatting in the hallway with another employee," she writes. "After a while, because of raised voices, I became aware that they were talking about me and my performance." At the end of the board meeting, the reader told the members of the board that she was aware of the general topics they discussed because she had overhead parts of their conversation. Several days later she was told by a board member that it had been unethical for her to stay in the hallway where she was standing because she could overhear. "Under normal circumstances, I would not have been able to hear the conversation if they had been talking in normal tones," she writes. "I don't feel I have an ethical obligation to move away from a conversation if the conversation becomes loud enough for me to hear when I have taken normal precautions not to hear." She makes clear that she was not able to hear all of the conversation, just bits and pieces. Because other members of the public could have just as easily been in the hallway with the reader, she believes that they would "certainly not have had any obligation to move." "Was it unethical for me to stay where I was knowing they were talking about me?" she asks. My reader shouldn't be held accountable for board members who chose to go into closed session and lacked the judgment to keep overheated and loud conversations in check. Because they went into the closed session presumably to protect the privacy of whomever it was they were discussing, they should have made sure that their discussion did not result in violating that privacy. Was it wrong for the reader to stand 10 feet down the hall and not move when she realized she and others could hear? Not exactly. But given that it was clear to those in attendance that the closed session was intended to be among the board members and no one else, once it became clear that the board's conversation was emanating into the hallway, the right thing would have been for someone to interrupt them and tell them that they were talking loudly enough that their voices were carrying through the closed door and well down the hall. It might have been embarrassing for the reader to be the one reminding them of this since it became clear she was the subject of their discussion. But she could have encouraged someone else to inform the board. And that would have allowed the board members to show the judgment and discretion they should have shown when they entered the closed session in the first place. Every day, a man who appears to be homeless sits on a curb near a retail store in a strip mall, holding a sign that reads "help needed." The mall is in a mid-size town in the San Francisco Bay Area. The man has been appearing for more than a year. He also makes daily rounds to other spots in town. An owner of a retail store in the mall is conflicted in her attitude toward the man. "I feel that his presence may cause people not to come into my store," she writes. Several times a day she walks by him as he sits on the curb -- and ignores him. She has spoken about the situation to her landlord, who has called police. However, the police say the man has a right to be there. "He is very intelligent," my reader writes. She's heard him debate with others quite articulately over his right to be there. She has also heard him tell people about the abuse he suffered as a boy. She indicates that he also "displays symptoms of mental illness." "As a human being, I want to have compassion, but can't find it in my heart," she writes -- adding that as a Christian, her faith is important to her and causes her to struggle with her attitude toward the man. "It makes me feel mean when I walk by him several times a day and ignore him." When situations arise that test the multiple values we hold, it can indeed be trying. The reader who owns the store would like to run a successful business that attracts customers so she can provide for herself and her family. For many people, the value placed on the health and well-being of their families tops their priorities. Does this mean that their other values -- such as caring for others in need -- are somehow diminished because they come second? Not necessarily, although such situations as the store owner's do seem to be a test of how far she will go to honor her values. It's understandable not to want someone who might make customers anxious loitering outside the door of a retailer. Still, we always have a right to choose whether and when to give to those asking for money. This fellow, though, seems to be asking for "help." Presumably, the assumption is that he wants money. But if he is indeed homeless and mentally ill, perhaps there are other forms of help that the store owner might seek advice about in an effort to serve both the man's needs and her own. I'm not sure she can determine the state of his mental capacity on her own, but she should certainly be able to consult with public health officials about this issue. If it's truly not the time it would take to address the issue, but instead the desire not to have the man scare off existing or potential customers with his presence, then to preserve her values of earning a livelihood and also helping those in need, the right thing could be to see if there's a way to help this fellow that in turn might result in helping herself. 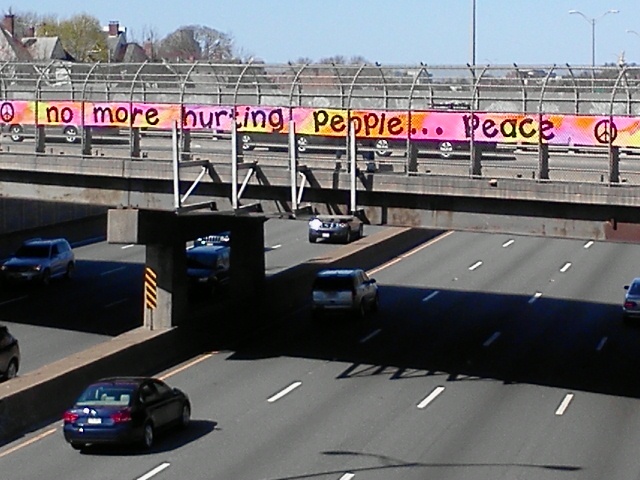 Banner honoring Martin Richard's words hanging over Route 93 in Boston. Designed by Liz Carney of Dot Art and created by neighborhood children and volunteers in Savin Hill area. It's been an eventful few weeks in Boston. The Boston Marathon, typically a celebratory event, was met with terror and tragedy. Just days later, people in the city and surrounding municipalities were voluntarily "sheltering in place" as law enforcement worked to find the men suspected of placing and detonating the bombs that killed and maimed. Soon after the identities of the three people killed by the bomb blast were made known, photos of Martin Richard, the young boy from my part of Boston who died in one of the blasts, were shown with him holding a sign with the words, "No more hurting people" and "Peace." An artist who runs a children's arts program in our community came up with the idea to have neighborhood children work on a banner featuring Martin's words. The plan was to paint the 85-foot banner on recycled acrylic wallpaper and then hang it from a bridge overlooking a highway that leads into Boston. Hundreds of kids showed up to paint on the Saturday after police caught the suspect. Adults showed up to help. Early on Sunday morning, the artist emailed me to ask if she could give me a call. She told me she was concerned because she had not obtained a permit from the city of Boston to hang the banner. I reassured her that it was unlikely anyone would question the spirit of the banner or request that it be taken down for lack of a permit, but I suggested she call our district city councilor. To ask him to secure a permit for us? she asked. No, I responded, to ask him to come help us. I figured that if our city councilor were involved in hanging the sign, the chances of the city taking it down were less likely. Given that we still had no permit to hang the sign, was this the right thing to do? If we had been asked to take the sign down, I certainly would have assisted in doing so (we didn't actually know if we needed a permit, although Boston being Boston, we assumed we did), but in this case, it seemed wise to heed the advice I first heard spoken years ago by Adm. Grace Hopper: "It's easier to ask forgiveness than it is to get permission." As our artist friend stayed and painted with the children, a 12-year-old boy from the neighborhood, our city councilor and my wife and I walked up to the bridge to start attaching the unwieldy banner. As we struggled to keep it in place by attaching it to the bridge by using zip ties, other neighbors began stopping to help hold it in place. Soon, there were more than a couple dozen people attaching the sign. Photos of the effort, including our city councilor affixing the banner to the bridge, were posted to Facebook. People shared images of the sign itself more than 3,800 times, often with messages of appreciation after having seen it while driving into the city. No one asked where the permit was to hang the banner. No one asked that it be taken down. The response was just appreciation from people for seeing the words from a little boy asking people to do the right thing.